A encounter with a boy dangling from the sky changes pickpocket Magpie's life forever. Like her, the boy dreams of flying over the rooftops of Paris. 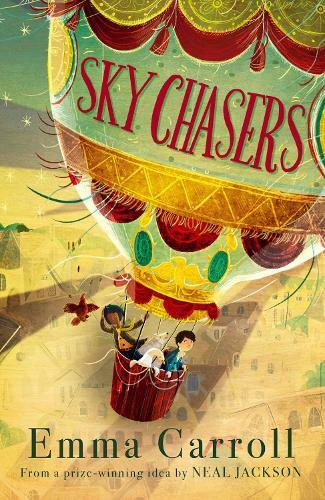 His family, the Montgolfiers, are desperate to be first to discover the secret of flight. Together with Pierre, Magpie is soon caught up in a world of inflatable bloomers, spies and a trio of unruly animals in a race to be the first to fly a hot air balloon - in front of the King and Queen of France. A much-loved children’s author, Emma Carroll’s first novel, Frost Hollow Hall, was nominated for the 2014 Waterstones Children’s Book Prize. Since then she has gone on to publish stories for children including In Darkling Wood, Frost Hollow Hall, Sky Chasers, Letters from the Lighthouse, Secrets of a Sun King and When We Were Warriors. A very clever, interesting factual event written by a master of historical fiction for kids.